Gait analysis has now advanced to a very important aspect of patient/client management of various gait abnormalities. This analysis is best thought of as an investigation, which is used along with the patient/client history, physical examination, range of motion and function of the foot and ankle in order to perform a detailed assessment of a patient’s/client’s stance and walking performance. Certainly a static (sitting, standing) evaluation is an integral part of the process. The gait cycle visibly describes how the client/ patient walks -in other words how they move. Observation of the individuals gait cycle helps in the appropriate selection of footwear and foot orthotics which then helps to improve function and performance. A complete analysis of one’s gait cycle is observed when the foot makes contact with the ground and ends when that same foot makes contact with the ground again. This process is made of two phases; Stance phase during which the foot touches the ground, and Swing phase during which that same foot doesn’t touch the ground. Heel contact of the initial stage is when the foot lands on the ground. The knee flexes just before the foot hits the ground and foot rolls into pronation, causing the foot and leg to act together as shock absorbers. During mid-stance the foot and leg provides a stable platform for the body weight to pass over. If the foot rolls into excessive pronation at this time there is too much movement and instability occurring leading to painful symptoms. Propulsion is the final stage of the stance phase occurring when the big toe turns upward, tightening the plantar fascia and helping to raise the arch of the foot. Swing phase then begins with the toe off and is just before the foot makes contact with the ground again and a new gait cycle starts. The primary focus of a gait analysis is to observe the degree of one’s pronation. Pronation is the natural inward roll of the foot as the outside part of the heel strikes the ground. Over pronation is when the foot rolls inward excessively and Under pronation (or supination) is where the foot does not roll inward enough. There is a large population of patients/clients who need our biomechanical expertise and guidance in the assessment of foot issues. These are the patients who are currently seeing physical therapists, chiropractors, family doctors and orthopaedic surgeons for ongoing aches and pains in the lower extremity. Even though Pedorthists treat primarily foot and ankle issues, they do understand the impact that the foot and ankle has on the rest of the body during gait. The easiest technique used in gait analysis is simply having the individual walk back and forth in the hallway or large room observing both the front and back of the individual. This is a quick and easy way to gain insight into their function. There are multiple options of observing gait function including digital cameras, video cameras, technology of dynamic scanning of the foot during gait and the ink mat is a valuable screening tool that is fast and easy to use. It is also a great visible tool for patient/client education. Pressure mapping of the foot during static and dynamic evaluation allows the professional and patient/client to see areas of high and low pressure during the stance phase of the gait. Pressure analysis allows one to see the center of force and torque through the foot while comparing to the function of the opposite foot. Using a combination of these tools allows the Pedorthist to perform a comprehensive assessment of the stance phase of the gait analysis. This is the phase where most of the lower leg pathology occurs and the one where we have the greatest impact of decreasing painful symptoms. 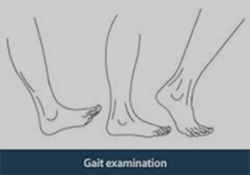 Gait analysis is an integral part of the evaluation process to help determine what the actual problems are, and this process helps to obtain valuable information which can then help to determine the best course of action for the patient /client. Gait analysis can also be helpful for patient/client follow-up assessments. Using gait analysis is an innovative way to help the Pedorthist to achieve a complete biomechanical assessment. Using gait analysis will help in determining which tools are needed to control the environment in which the foot functions. These tools may include foot orthotics, shoes, shoe modifications. While gait analysis itself is by no means a cure, it is an effective evaluation that will help in achieving the best possible outcomes for the patient/client.